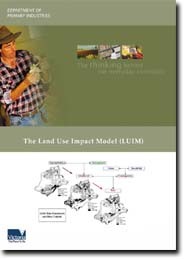 This report describes the evolution and capability of a Land Use Impact Model (LUIM) used in the Department of Environment and Primary Industries, Victoria. We use the LUIM to rate and map the risks to soil, land, water, and vegetation under different land uses and practices. It can be used to rate the present risks of current land use. It can also be used to evaluate scenarios of changed land use and practices. The LUIM’s primary benefit is in environmental reporting and planning. It is available through DEPI to any person or authority wishing to use it for research or planning purposes.